On Monday night I went to an really fun Stampin’ Up! event that was available to demonstrators only. Stampin’ Up! held a new Catalog Premiere where all the demonstrators who attended could get a glimpse at some of the products coming out in the new catalog that starts June 1st. They rented out 40 movie theaters all over the country and one of them was in Syracuse. I have to say it was the best “movie” I have ever been to! The best part is at the end of the even everyone got a new stamp set that will be in the catalog AND a copy of the catalog. Isn’t the cover cute? The sad part about this whole thing is there are some stamp sets and accessories that are not in the new catalog. The card I made uses a few of these retiring items. The heart is from Hearts A Flutter. The “Forever & Always is from Loving Thoughts. The ribbon is also retiring (and already sold out!) and so is the Embossing Folder, called Adorning Accents, but is not sold out yet. Merchandise is going quickly so if you want something that is retiring you need to buy it soon before it is gone for good! Some of my favorite stamp sets are on the Stampin’ Up! Retirement List so I thought I would “showcase” some of them. This particular card has three sets that are all saying goodbye. The flowers are from the stamp set called Field Flowers. I love this set because it reminds me of my childhood and all the vacations we spent at my grandparent’s house in Vermont. Their house was surrounded by fields of wild flowers that looked just like this. The background stamp I used is called and is another one that is on the Retirement List. I love this stamp too! Finally, the sentiment is from Delightful Dozen. Delightful Dozen has 12 (bet you couldn’t guess that!) different sentiments in it that cover just about any occasion you might have. The main thing about the Retirement List is, once an item sells out, it is gone forever so if you like anything on the list, you should buy it now. One the best things about being a Stampin’ Up! demonstrator is you get to see the new catalogs before anyone else. 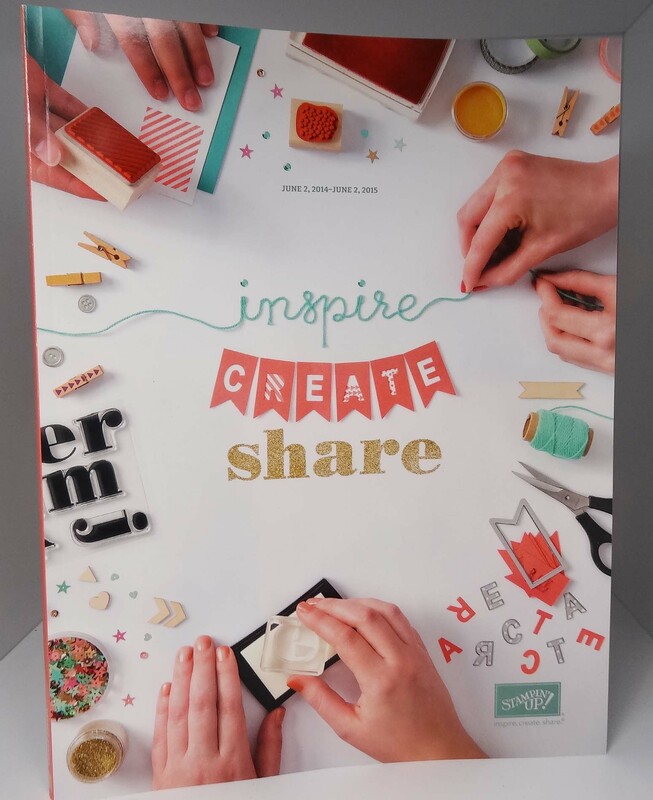 This year Stampin’ Up! is hosting a Catalog Premiere. They picked 35 cities across the United States and Canada where they are having these events. I am so excited because they are having one in Syracuse, New York which is only a little more than an hour away. At this event I will receive the 2014/2015 Annual Catalog. I can’t wait to see it! The other really nice thing about this event is that I have been invited to have dinner beforehand with some other Stampin’ Up! demonstrators. There are going to be 13 of us meeting before the show. I have met one of the ladies but I have not met any of the others. 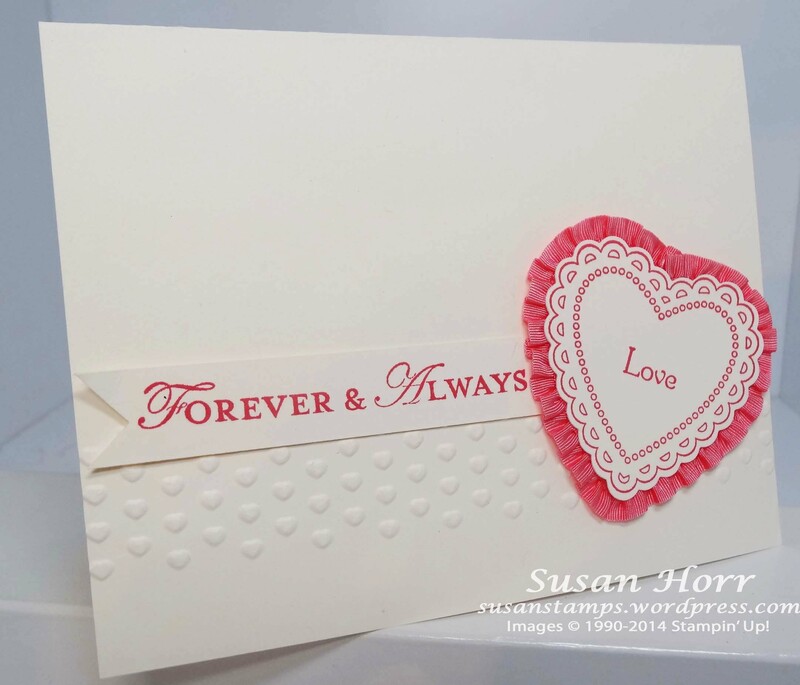 It will be fun to meet other people who share my love of Stampin’ Up!. Normally at these events we swap. Swapping is where each one of us makes a ton of cards and we swap our cards for their cards. It is a way to get some new ideas as well as meet other people. I am actually not swapping because it would be too hard to do since the retirement list just came out and no one really wants to swap using retiring merchandise. I am, however, making a small gift to give each of the ladies who are meeting for dinner. I made little Post-It Note holders our of bar coasters and decorated them with our Designer Series Paper. Each one is different. Some have ribbon or buttons and some have clay flowers. Here is a picture of them. I made this card using the leaves from the Bird Builder Punch. I think that leaf is my favorite part about that punch. It makes a whole branch of little leaves that can be used a lot. Of course, I used it to make the actual wreath. The little flowers came from the Itty Bitty Shapes Punch Pack. There is a set of three punches in this pack. Unfortunately, it is retiring at the end of this catalog (or until it sells out, whichever comes first) so if you like it, you should order it before it disappears forever. 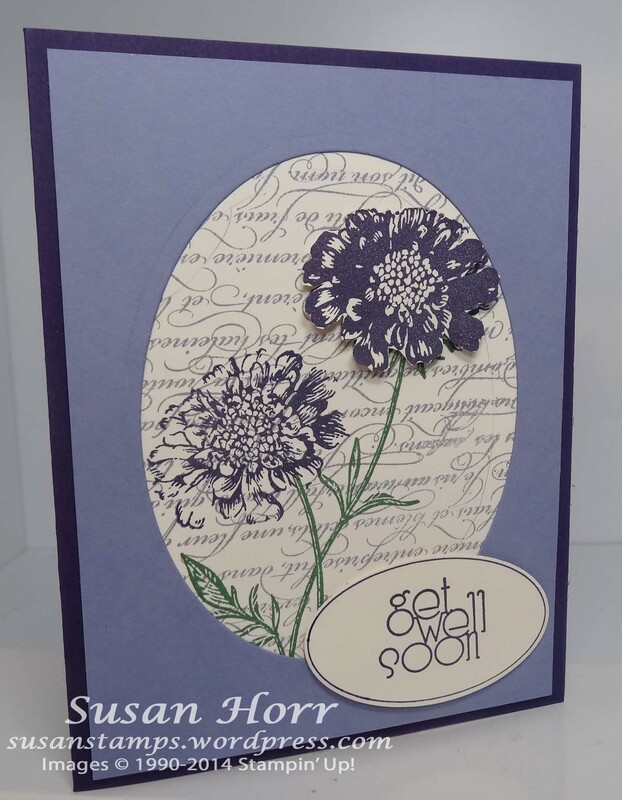 The sentiment I used is also part of a stamp set that is retiring called Sweet Essentials. There are 8 great greetings in this stamp set, so again, if you like it you should order it before it sells out. I am so happy that the stamp set called Lovely As A Tree was not retired! It has broken all records of any stamp set that has been in the catalog. I think it first showed up in the 2001/2002 came out and I am glad it is sticking around. Even Shelli Garnder, the CEO of Stampin’ Up! said she hopes it will never retire. The one sad thing about this card is the sentiment is from Oh, Hello and that is retiring at the end of this catalog year. I really love the sentiments in that set so I will be sad to see it go. Actually, I am not sure why I am sad about it because I own it! 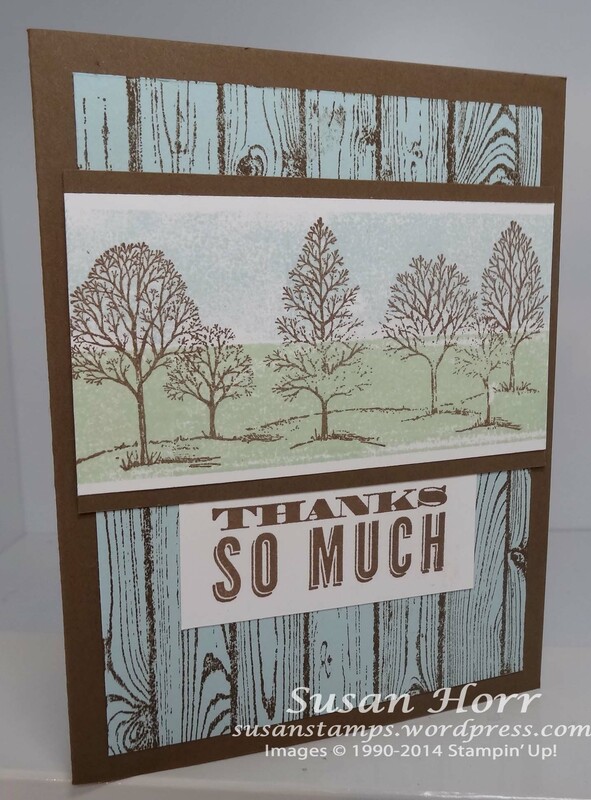 The background of this card was made using the background stamp called Hardwood. This stamp is in the Occasions Catalog and I am hoping it will go into the annual catalog too! I also used the Framelits called Apothecary Accents and a Tea Lace Paper Doily for the background. I enbossed the Strawberry Slush cardstock with the Honeycomb Embossing Folder and the “hello” stamp is from Perfect Pennants. Today is the last day for free shipping! Take advantage of this while you can! Every month I give my Club Members a card challenge to do. Usually it is a layout but sometimes I do a color challenge too. They seem to like it and it makes them use the products they buy. This is the challenge I gave them for May. This month I decided to participate in the challenge myself. Usually I don’t but I am not sure why. Here is the card I made. The first thing you will notice is my Designer Series Paper strips are the opposite of the challenge. I could say I did this on purpose but I have this little habit of making cards and then realizing I put the stamps or paper on the wrong side so it opens incorrectly. Yes, I did it with this card too. Luckily I realized it before I glued on the cardstock that has the flowers on it and the sentiment. Of course, one of the best things about challenges is you don’t really have to follow it exactly so I could have just omitted telling you that and you would have never known! 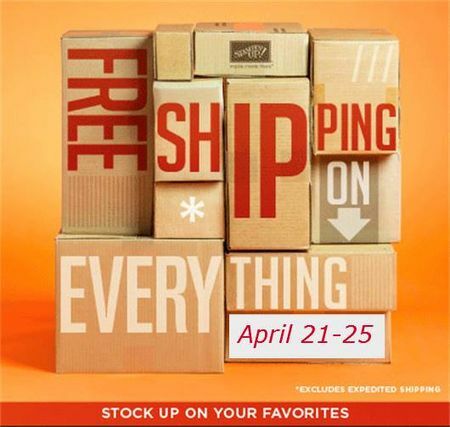 Don’t forget you can still get free shipping on all your purchases!